Holidays are not only celebrated in the theme parks of Walt Disney World. While everyone knows about the jaw-dropping collection of gingerbread houses, Christmas trees, and numerous other festive touches the resorts diligently apply, but there have also been seasonal showcases for guests to feast on. On such performance ran from 1992 through the 1998 holiday seasons in the Contemporary Resort and warmed the hearts of even the stingiest Scrooges. 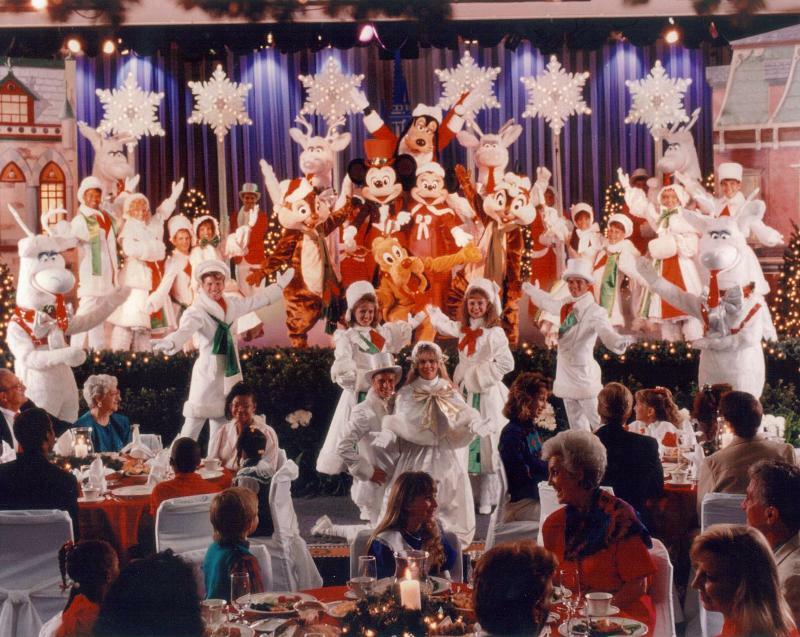 The Jolly Holidays Dinner-Show Spectacular ran in the Fantasia Ballroom and included over one-hundred performers. From dancers and singers, to Rudolph Pluto, reindeer, and other characters from Mickey’s family of friends decked out in their warmest winter wear, the pageantry was a sight to behold. Sections of the show included an abbreviated Nutcracker and caroling. Second only to the stage production, the dinner portion of the dinner-show featured traditional holiday favorites as well as twists on longstanding traditional fare. The Jolly Holidays Dinner-Show may no longer be entertaining guests during the winter season, but for those who witnessed it, it has a warm spot in their memories. Away from the park theatrical productions are few and far between, but when they come around they leave lasting impressions. My husband and I had the pleasure of seeing this show on our honeymoon SEVERAL years ago. It definitely left a "magical" impression on us and I'm sad that they chose to discontinue it. I would have loved to take my kids to it when we brought them to the world for the first Disney Christmas!